An increasingly mobile workforce—with geographically dispersed fleets of devices—presents significant challenges in systems management. Administrators need to inventory, provision, patch, diagnose and repair PCs, even if those systems are powered oﬀ or the operating system is not running. When in-person assistance is an option, users can experience significant interruptions in productivity. ...Security can be weakened as well; exposure to a new threat may be prolonged while technicians work to install patches, endangering the entire network. 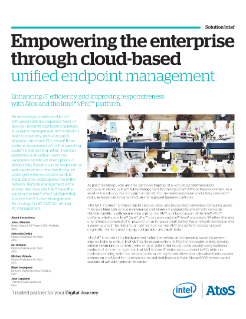 Remote management is the answer, and Atos and Intel have the solution: the Intel® vPro™ platform that includes Intel® Active Management Technology (Intel® AMT) for remote PC management.